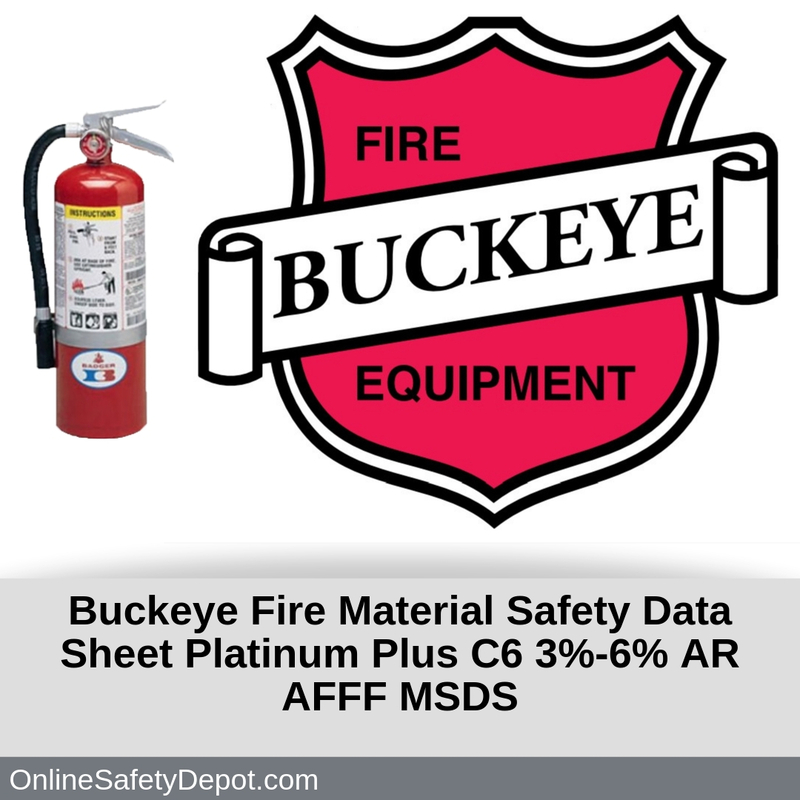 Buckeye Fire manufactures Platinum Plus C6 3%-6% Aqueous Film Forming Foam Concentrate designed to fight Class A and some B fires using water-based agents that do not leave a powder residue. This section explains how to identify the Aqueous Film Forming Foam fire extinguishant and provides various hazard and precautionary statements pertaining to health. This section explains how to treat chemical exposure to the eyes and skin as well as how to treat someone who has inhaled or ingested the chemical. It also identifies existing medical conditions that may be aggravated by exposure to the Aqueous Film Forming Foam. This section identifies the agent as a nonflammable and noncombustible agent that may decompose in fire and release oxides of sulfur and nitrogen. This section instructs to avoid eye, respiratory, and skin exposure to the agent, the use of personal protective equipment when handling to limit exposure, and that the product should be stored in its original container or extinguisher. This section presents the known exposure effects from routes of entry through eye or skin contact, or inhalation and ingestion issues due to “chronic toxicity”, and any “reproductive toxicity”. This section identifies any effects that agent has on ecosystem toxicity and aquatic life. This section identifies if the product is considered a hazardous material and how that can affect transportation of the agent in the US or Canada. This particular product is not considered hazardous.